Around the Island - 2011. "Getting ahead of the pack." 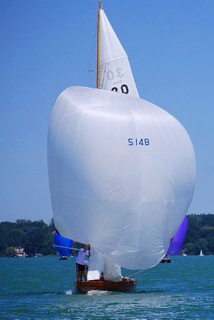 Supa Sails once again featured well in the annual Around the Island Race run by the Lake Deneys Yacht Club in February this year. 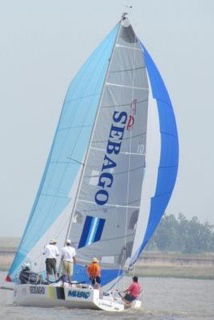 Attracting an entry of some 380 boats, Supa sails were to be seen on many winning boats in the various categories. 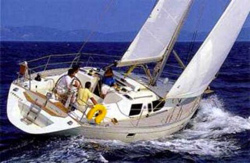 1st Keelboat - Pacer 27 Sebago Music. 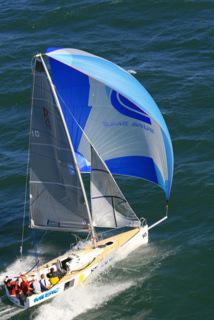 Pacer 27 Nationals – Cape Town. Ian Gibson, owner of Pacer 27 Unruly has now competed in four Nationals and just before the recent one in February, he came to Rob with an order for a new Genoa and Asymmetric. For the Genoa we selected Contender Maxx A15 AP, an all Kevlar/Mylar Laminate, especially engineered to allow for cross cut paneling, resulting in better shape control and a smoother sail. The kite was also made from Contender Superkote 75/60 featuring our own elliptical cut construction, giving the best shape retention possible. This combination resulted in a first place at the Nationals for Ian. As a bonus they also won IRC Division I in the Mykonos Regatta with Sebago Music, another Supa Sails equipped Pacer 27 (pictured above) finishing third. 30 Squares - Starnberger See. 5.0.5 Nationals - Richards Bay. Supa Sails made a clean sweep at the recent Nationals filling all three top spots. A good range of winds were experienced, from light and lumpy conditions to serious trapezing weather. 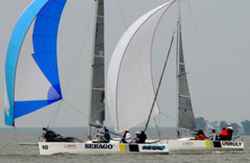 Our 5.0.5 sails are made under license to Bojsen-Moller in Denmark whose sails have won the last 2 World Championships, namely, Denmark 2010 and Australia 2011. 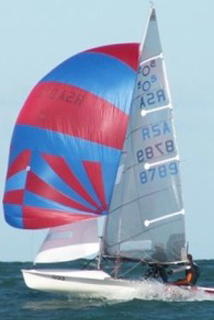 Hi Rob, Have used the Furling Genoa quite a few times now. Shape is great and boat moves well in light air. Also used sail cover and it fits well. Thanks for a job well done. On winning the Nationals - We certainly never felt slow with the new sails, which gave us the freedom to concentrate on race tactics.